We’re anchored in Raby Bay, Brisbane. It’s a quiet bay with about 10 other boats moored close to shore. We are right on the spot where the depth goes from 3 metres to 1 metre. Our boat draws 1.7 metres so we need the deeper water. It’s the furthest we’ve ever anchored from shore. The dinghy ride in is long and a bit wet if the wind has picked up and the water is choppy, or it is quite lovely and relaxing if the water is calm (choppy yesterday, calm today). Today we are on a mission to buy petrol for our generator and outboard motor. We have an early lunch at around 11am and then get ready and hop into the dinghy. We are getting better at remembering to take our rubbish with us when we go ashore, and this time, along with the rubbish, we have empty 20L and 10L jerry cans. Arriving at the beach we had checked out yesterday, Markito jumps off first with a serious look on his face and the rope tightly in his hands. 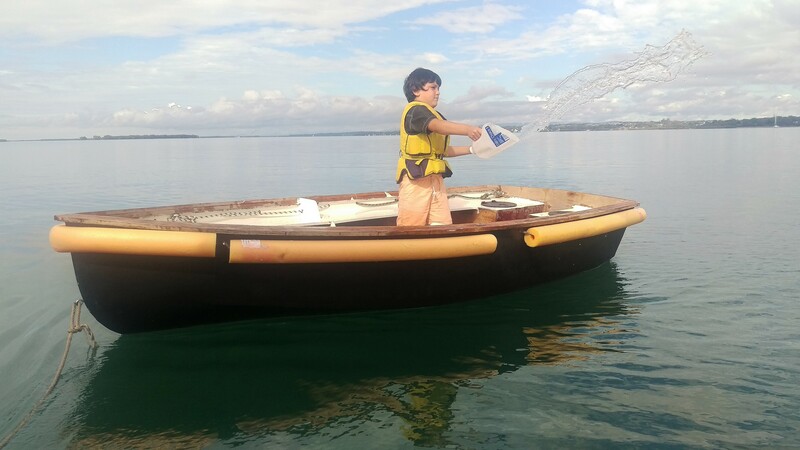 He runs up ahead to hold the dinghy steady for the rest of us – one of his important jobs. Then I get off. Then Zach, then Freyja, then Simon. Zach and Freyja have a little play while Markito, Simon and I carry the heavy dinghy about 20metres up the beach to tie it onto a tree. The tide is out, which means we have to carry it extra far so it’s still on the sand when we get back in a few hours and the tides back in. Then I get off. Then Zach, then Freyja, then Simon. Zach and Freyja have a little play while Markito, Simon and I carry the heavy dinghy about 20 metres up the beach to tie it onto a tree. The tide is out, which means we have to carry it extra far so it’s still on the sand when we get back in a few hours and the tides back in. The playground nearby is enticing. We’ve brought the dinghy to this beach specifically because we know the playground is here, but it’ll have to wait ’til after our main job is done. We start walking, a merry little crew all feeling relaxed and in a collective good mood. It’s a lovely 20 degrees and there is not a cloud in the sky. We need to walk 3 km to the petrol station, fill up the jerry cans, and walk 3 km back again. There are two things that make getting this job done particularly enjoyable. 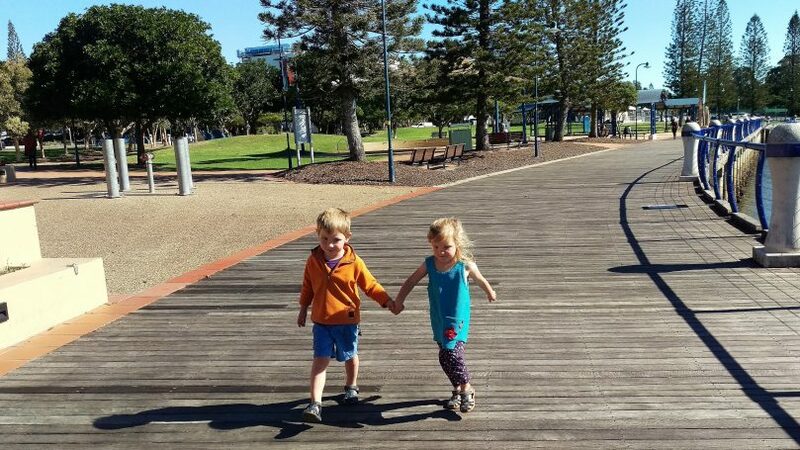 First, Zach and Freyja are going through a ‘holding hands’ phase (please refer to featured image above). They love holdings hands ALL THE TIME! It is seriously the cutest thing 3-year-old twins could possibly do. So, they are off holding hands in their own little twin world chatting away to each other up ahead, much to the delight of the rest of us who dutifully follow along, yelling out instructions every now and then (“Oi! Not that way, this way!”…etc). 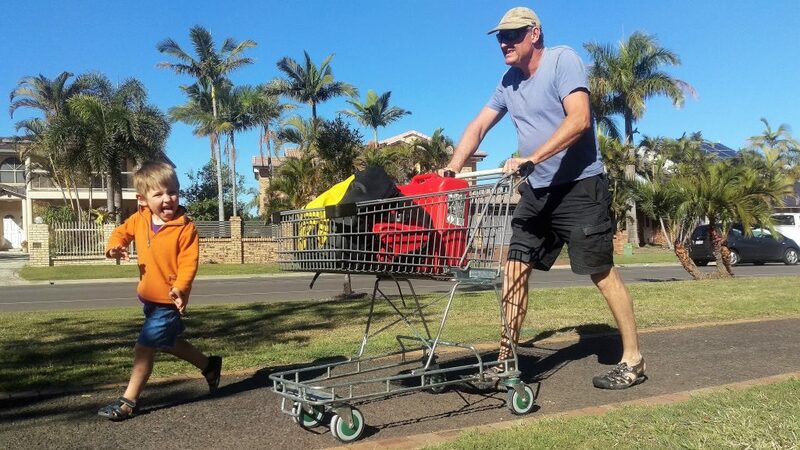 We walk the rest of the way to the petrol station, buy the petrol, lug the heavy jerry cans back to the magic spot, and then happily pop the jerry cans into the most appreciated shopping trolley I have ever used. Those jerry cans are heavy! Side Note: I imagine you are wondering why we didn’t just push the empty trolley to the petrol station and then push the full jerry cans all the way from there. Well… to be honest the thought didn’t even cross my mind. Also, in hindsight, the first half of the trip is through quiet suburban streets, while the second half is along busy roads with more obstacles on the footpaths. Anyway… we arrive back at the playground with a trolley full of unleaded petrol to find a bunch of kids playing. Perfect! Simon and I relax in the sun while the kids join in and have a big play. After bananas, apples and mandarins for afternoon tea, it’s 4pm and time to jump in the dinghy and head back out to our floating home. Showers are waiting, as is the slow-cooker meal Simon prepared this morning. Yum. ‘And how did you get to Raby Bay?’, I hear you ask. Well, now there’s a story. The short answer is: with some difficulty! It’s Friday today. 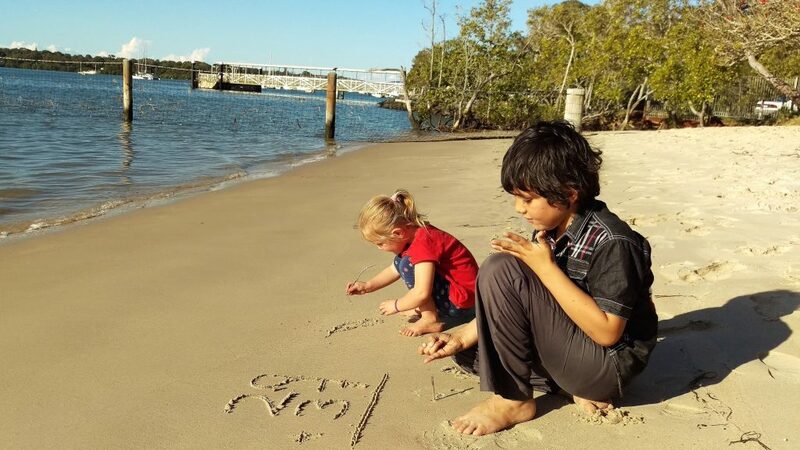 We left the Gold Coast exactly a week ago and arrived here in Raby Bay on Wednesday 19th. Between the Gold Coast and here we’ve anchored (in order) at the northern end of South Stradbroke Island, Karragarra Island, Coochiemudlo Island (we did a great walk around the island, beautiful spot) and Victoria Point. It is quite tricky maneuvering a boat of our size through these waters. Simon was on high alert each time we set off because in several places we found the information on the charts (both chart programs on the computer and cruising guide books) didn’t match the reality we were experiencing. This was a challenge as we rely on the charts to give us important details about the depth of the water and hidden sand banks, which then helps us make decisions about where we can and can’t go. When we left South Stradbroke Island the mismatch between the charts and reality resulted in us getting stuck in the mud a few times. The first time it happened was a little stressful. It’s the first time either of us has experienced what it feels like for Dragonfly’s keel to be on the bottom. As usual, though, Captain Simon was calm and focused. While I hung around in the cockpit feeling a bit nervous and ready to jump into action if I was needed, the kids were playing inside completely oblivious to what was going on. The first time we got stuck was near the southwest corner of Eden Island and it took us a while to get off the bottom. Simon was able to move the boat around enough, reversing and going forward and then repeating that motion on an angle, to get us moving and then off the bottom, only to go a few metres and get stuck again. It was getting frustrating after a while as it was unclear which way we should be trying to go. The water around us all looked the same – there was no way to tell where the depth changed – and the charts were right off. It wasn’t scary, though, as we were never in any danger. The patch of water we were in was quiet with only a few small fishing boats passing us every now and then (you lucky things with your carefree keel-less boats!). It was also low tide so we knew the worst-case scenario was having to wait a couple of hours for the tide to come in. When we eventually made it back into deep(er) water we turned around and went back the way we had come, looking for a better route through all the small channels. These decisions were hard as we now didn’t really trust the charts. The red line on this chart marks our route. The red dots mark our anchorages. The last dot up the top is Raby Bay. 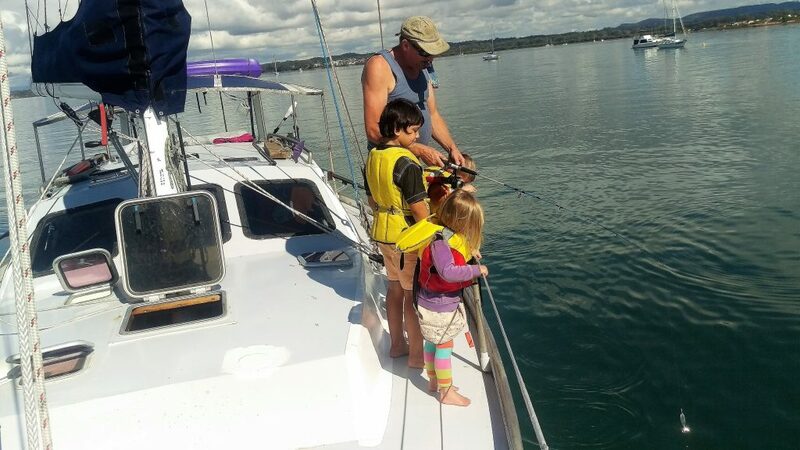 We got stuck one last time around the bottom of Tabby Tabby Island, and then made it out into a larger waterway where we had a smooth trip up to our next anchorage at Karragarra Island. We stayed at Karragarra Island for two nights. Once we’d sufficiently recovered from our intense day traveling there, we headed back into those unpredictable waterways and headed for Coochiemudlo Island. Surprise, surprise – on the way we got stuck on the bottom again. This time it was just east of Pannikin Island. Bugger! But at least now we were accustomed to the sensation of the boat slowing to a halt, and Simon was improving his ‘get us off the bottom’ boat wiggle. While not really something you want to get really good at, it’s reassuring to know we can do it when we need to. 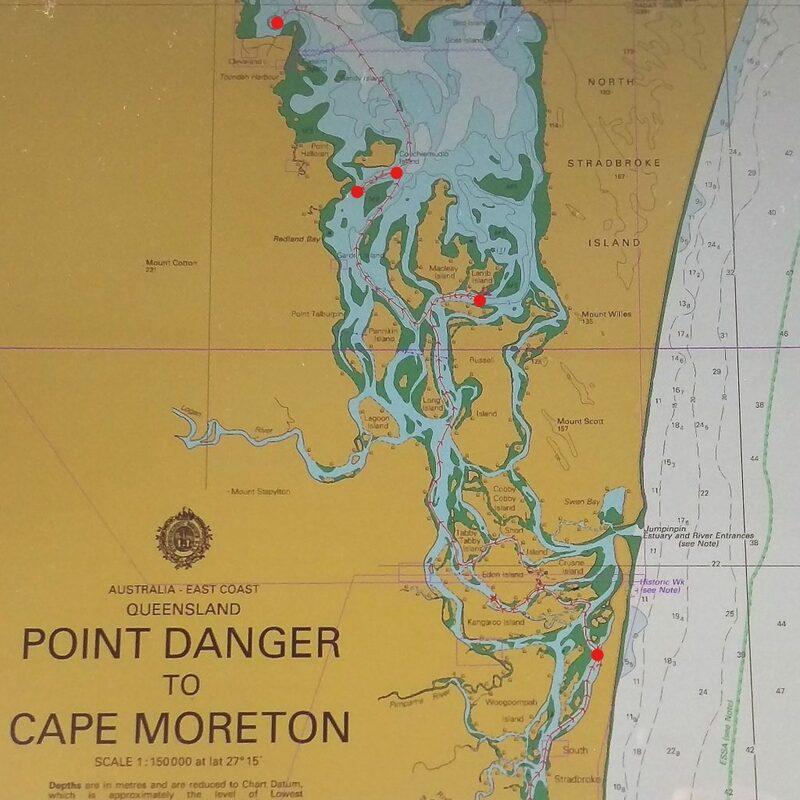 It felt good to arrive here in Raby Bay as we are now north of the tricky inland waterways and able to sail easily through deep water again. Phew! RANDOM NOTE: I made sushi for lunch the other day and I just want to put it on the public record that Markito said, “mum, your sushi is even better than the ones we buy at the shop”. 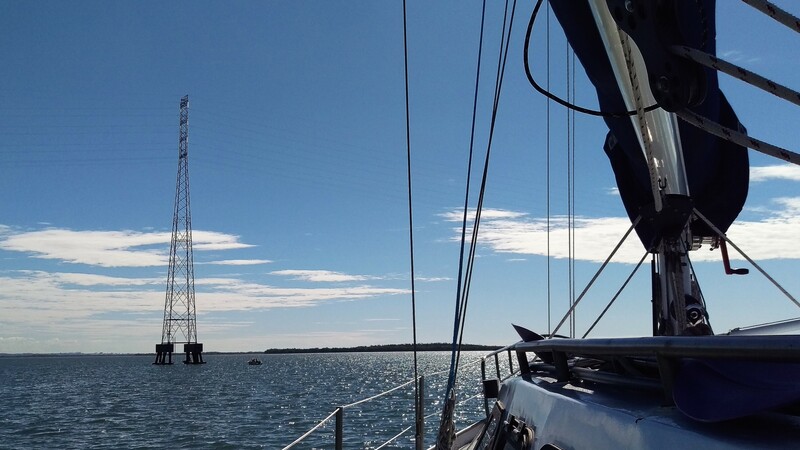 First time sailing under electricity pylons and wires. Between Russel Island and the mainland. 15 July 2017.